What do geriatric fall prevention, diabetes management, work injury diagnostics, autism-focused linguistics, and behavioral neuroscience have in common? They are the five research disciplines of the newest cohort of tenure-track faculty appointed to the USC Division of Occupational Science and Occupational Therapy. Every day, an estimated 850 Americans fracture a hip after falling at home or in the community. For Natalie Leland, that’s a statistic that must be reduced through improved preventive and post-acute occupational therapy care for older adults, and her research is exploring ways of doing just that. Natalie Leland comes to USC from Brown University’s Center for Gerontology and Health Care Research. 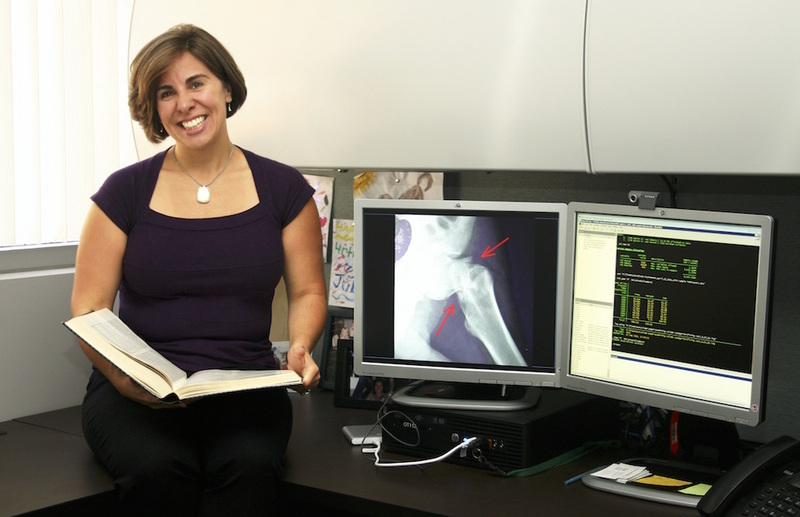 There, she completed a postdoctoral fellowship in which she examined questions related to post-acute care access, patient outcomes, and quality of care among Medicare beneficiaries who experienced their first hip fracture. Though she is a gerontologist by research training, having earned her Ph.D. and M.S. degrees in Gerontology from the University of Massachusetts, Boston, Leland’s research questions retain an occupation-centered focus on activity performance and participation reflective of her clinical training and practice as an occupational therapist. After graduating with a B.S. degree in Occupational Therapy from the University of New Hampshire, Leland practiced as an occupational therapist in nursing homes. But too many of the clients she was treating in nursing homes, a majority of whom were admitted after a hip fracture sustained from falling at home or out in the community, told a strikingly similar tale. After fracturing a hip, older adults typically undergo orthopedic surgery, stay a few days at a hospital, and are discharged to a nursing or rehabilitation facility. But for many who have fractured a hip, the combination of immobility, deconditioning and physical complications during rehabilitation means they never fully return to their pre-fall levels of mobility, functional activity or social participation. To clinicians like Leland with a keen appreciation of how activities and the physical environment interact to contribute to a person’s fall, improved occupational therapy practice patterns are anticipated to improve the patient’s overall rehabilitation outcomes, which ultimately translates to improved quality of life. 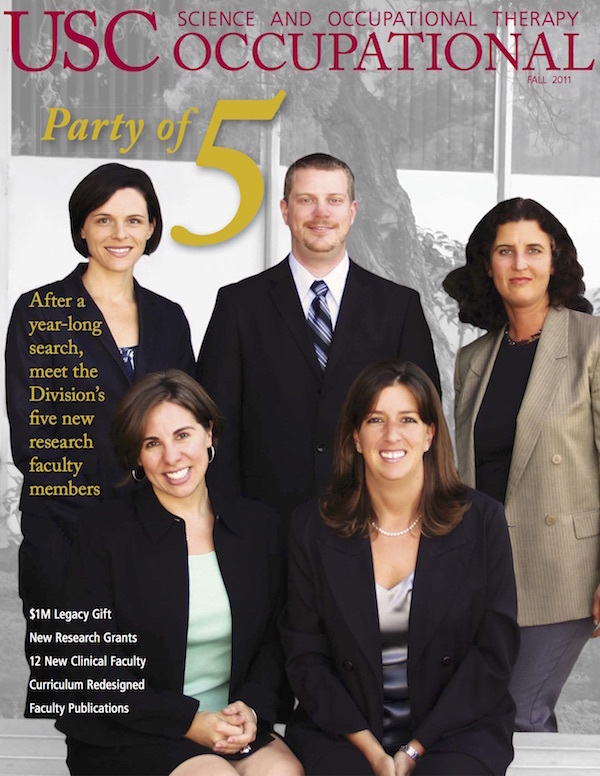 The promise of better clinical results through research was Leland’s motivation to pursue a research science career dedicated to preventing falls, examining how and why they occur and optimizing the rehabilitative care afterwards. “My work aims to gain a better understanding of fall prevention and how we can improve care for older adults who have experienced a fall or are at risk for a fall,” Leland says. And though gerontological occupational therapists are well positioned as the health professionals of choice for preventing falls, the scientific research base for therapeutic interventions can still be expanded. Fortifying this research base will be Leland’s primary objective at the USC Division of Occupational Science and Occupational Therapy. Leland is dually appointed at USC with the Division of Occupational Science and Occupational Therapy and the Davis School of Gerontology. She has already co-authored research publications in collaboration with faculty members at the Davis School of Gerontology. In addition to her research activities, she is teaching in the occupational therapy professional program. Leland also has public leadership experience as the Chair of the Emerging Scholars and Professionals Organization (ESPO) within the Gerontological Society of America and is the immediate past President of the Rhode Island Occupational Therapy Association. Leland, N., Porell, F., & Murphy, S. L. (2011). Does fall history influence residential adjustments? The Gerontologist, 51, 190-200. Once a disease typically reserved for life’s later stages, type 2 diabetes is now affecting the health and lifestyles of increasingly younger populations. Elizabeth Pyatak is researching approaches to help manage the new face of diabetes. In 1998, Elizabeth Pyatak set foot on the USC campus as a Trojan freshman. After completing her undergraduate degree in Psychology and graduate and postdoctoral training at the USC Division of Occupational Science and Occupational Therapy, Pyatak joins the Division as an assistant professor. 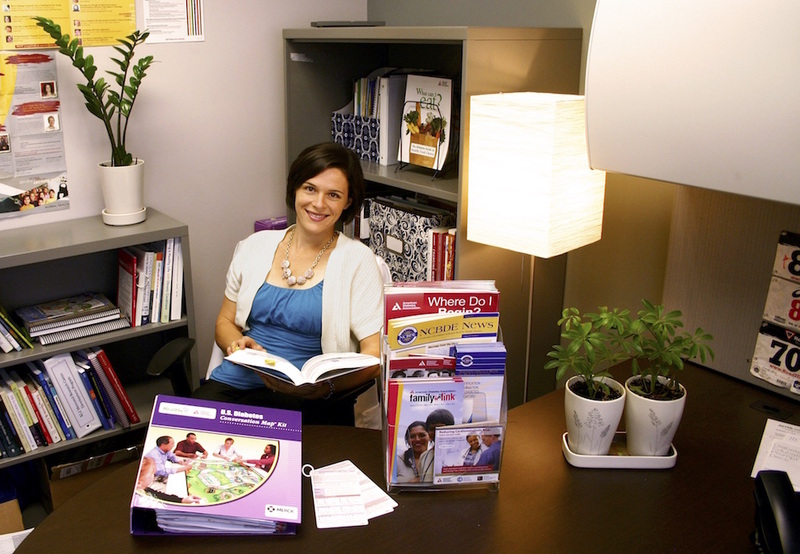 Thirteen years after arriving, her USC academic journey has drawn her into studying the intricate choices people make within the everyday contexts of chronic care management. As an Occupational Science doctoral student, Pyatak interviewed young adults with diabetes to examine how their occupational choices impact their everyday performance of the activities required for successful diabetes self-care, such as monitoring blood glucose, injecting insulin, managing medications and making health-promoting nutritional decisions. Her findings, which were published earlier this year in the American Journal of Occupational Therapy, will help researchers understand the ways people with diabetes, especially young adults, manage their own health within the course of everyday life. It’s a complicated issue that has been relatively unexplored within occupational science and occupational therapy literature until now. “Not much is known about young people with type 2 diabetes because it’s such a recent phenomenon,” explains Pyatak. “We don’t really know what ‘health’ looks like over the long term for people who get type 2 diabetes at sixteen years old, as opposed to 60 years old. My doctoral research revealed significant areas of disconnect between the lifestyles of young adults and their approach to diabetes self-care,” Pyatak says. Lifestyle choices and self-care behaviors significantly affect health and quality-of-life outcomes in chronic diseases such as diabetes, yet they are some of the most challenging issues to address in traditional health care settings. Thus, the significance of Pyatak’s future research lies in developing therapeutic interventions aimed at enacting lifestyle changes that are still sustainable within individuals’ life circumstances. “Ultimately I’m looking for ways to help people with diabetes live healthier, longer lives,” she says. During her postdoctoral fellowship, Pyatak worked on the USC Pressure Ulcer Prevention in Spinal Cord Injury trial, which is investigating the efficacy of a promising lifestyle intervention to prevent pressure ulcers among at-risk populations with spinal cord injury. As a result, she received advanced training in the design and operation of clinical trials involving lifestyle interventions. Like diabetes, spinal cord injury is a lifelong condition that requires daily monitoring and actions to prevent secondary complications. Building upon these principles of chronic care management and intervention, Pyatak has begun to collaborate with faculty at the Keck School of Medicine of USC and LAC+USC Medical Center to implement a transition program, funded by the Leona M. and Harry B. Helmsley Charitable Trust, aimed at improving health and psychosocial outcomes as well as increase rates of medical follow-up among young adults with diabetes. Her postdoctoral work also positioned her to win a KL2 mentored postdoctoral research grant from the USC Southern California Clinical and Translational Science Institute, a competitive award for young career scientists at USC to accelerate the development of translational health care science. The award supports Pyatak’s current study, entitled “Beating the Odds: Facilitating Lifestyle Change in Urban Latino Young Adults with Diabetes.” Building upon her doctoral and postdoctoral research, the study develops and validates an innovative, context-sensitive, community-based, manualized lifestyle intervention for diabetes management and will include a pilot study to analyze its potential to improve health and quality of life outcomes among urban, low socioeconomic status Latino young adults with diabetes. To Pyatak, the implications for occupational therapy clinicians are clear. “Occupational therapy practitioners are an untapped resource for chronic care management, especially among minority and underserved populations in primary care settings,” she says. Regardless of the presenting condition, she also believes that preventive lifestyle-based occupational therapy interventions aimed at chronic disease management and primary care populations will become a significant practice area for the profession. Pyatak, E. (2011). Participation in occupation and diabetes self-management in emerging adulthood. American Journal of Occupational Therapy, 65, 462-469. Every day an estimated 9000 Americans are injured at work, amounting to a total annual economic cost of over $170 billion, in addition to the more intangible impacts to human health, workplace self-identities and job-related skills. Shawn Roll is investigating ways of using diagnostic ultrasonography to understand work-related injuries and to develop interventions to put injured workers on a faster track to recovery. The sheer incidence of work-related injuries was perhaps one motivation for the American Occupational Therapy Association (AOTA) to explicitly target Work and Industry as a key practice area for occupational therapy to make a scientific and societal impact for realizing the 2017 AOTA Centennial Vision. Quality clinical interventions, and the research evidence supporting them, have the potential to keep workers healthier by preventing injuries and accelerating recovery, especially for repetitive stress injuries sustained in the workplace. Research scientists such as Shawn Roll are playing a critical role in finding innovative methods of keeping workers healthier and rehabilitating injured workers faster, especially as the work force ages and technologies continue to be developed. “Understanding the interplay of the person, occupation, and environment makes occupational therapists the ideal professionals to have a profound impact on the health of the working population,” says Roll. Roll researches the utility of diagnostic ultrasonography for the evaluation and clinical management of carpal tunnel syndrome (CTS) and other musculoskeletal work-related injuries. Carpal tunnel syndrome, caused by a combination of factors that increase pressure on the median nerve within the wrist’s carpal tunnel, is the most common peripheral neuropathy and when left untreated can cause permanent numbness, pain and muscle atrophy in the upper extremities. While the condition is typically diagnosed using a variety of methods, ultrasonography provides the advantage of allowing real-time observation of the movements and measurements of nerves and tendons as they pass through the carpal tunnel. 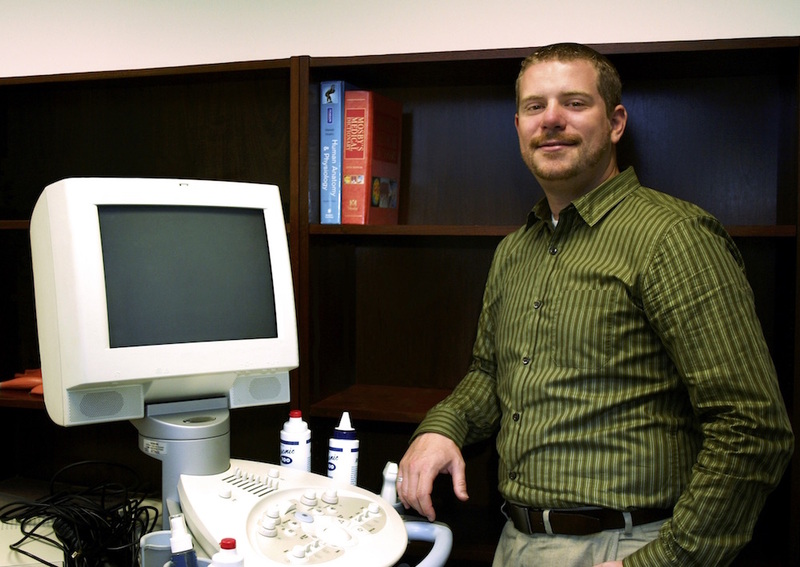 Roll’s interests in using ultrasound to evaluate tissue morphology in work-related injuries come from his early career clinical experience as an occupational therapist, when he treated patients in programs focused on assessment, prevention and rehabilitation of work-related injuries. After completing his undergraduate studies at Ohio State University (OSU), Roll continued his postgraduate training at OSU as well, obtaining a master’s degree in Allied Health Education with a Minor in Research Methods and his PhD in Health and Rehabilitation Sciences with an Interdisciplinary Specialization in College and University Teaching. As a PhD student, Roll worked with the research team at The Laboratory for Investigatory Imaging at The Ohio State University College of Medicine School of Allied Medical Professions, directed by Kevin Evans. The laboratory’s dedicated purpose is to investigate the translational potential for ultrasound imaging innovations. For research conducted in collaboration with lab faculty, Roll has already received publication in the Journal of Diagnostic Medical Sonography, the Journal of Ultrasound in Medicine and Ultrasound in Medicine and Biology, with several more forthcoming articles under review and in press. He also currently serves on the editorial board of WORK: A Journal of Prevention, Assessment, & Rehabilitation. Roll, S. C., & Evans, K. D. (2011). Sonographic representation of bifid median nerve and persistent median artery. Journal of Diagnostic Medical Sonography, 27, 89-94. Early identification of autism is critical to optimizing quality of life for children with autism and their families. But the path to diagnosis may be shaped by both structural and interactional factors. Olga Solomon is investigating these and other social aspects of families’ experience of autism diagnosis and services. Of the new tenure-track faculty appointed at the USC Division of Occupational Science and Occupational Therapy, Olga Solomon is perhaps the most familiar. That’s because since 2005, Solomon has been a key contributor to the Division’s core research programs in autism, engagement and family life. During the past two years, Solomon has led an interdisciplinary research team as principal investigator of the NIH-funded R01 research grant “Autism in Urban Context: Linking Heterogeneity with Health and Service Disparities.” The study, which concluded its data collection phase in September of this year, utilizes multi-method and ethnographic approaches to investigate health and service disparities in Autism Spectrum Disorders (ASD) diagnosis of African American children living in Los Angeles. By examining heterogeneity in ASD, the project anticipates to identify opportunities for, and barriers to, the development of collaboration among families and practitioners in timely and efficient ASD diagnosis and interventions for African American children. “This project is a unique opportunity to have a direct positive impact on the lives of children and families, which is consistent with the goals of occupational science,” Solomon explains. While acquiring funded research grants from the National Institutes of Health is certainly a significant metric of academic success, Solomon’s portfolio of autism-related scholarship is even more comprehensive. In 2008, she received an Individual Award from USC’s James H. Zumberge Faculty Research and Innovation Fund for her project, “Animal Assisted Therapy as Socially Assistive Technology: Implications for Autism.” A passionate dog owner herself, Solomon hypothesized that the human-to-animal interactions facilitated by trained therapy dogs could help children with ASD to practice the social interactions that form the underlying foundation for human-to-human communication. She also designed and taught the Special Topics graduate course “Innovative Technology for Autism Spectrum Disorders.” The seminar course, which was hosted at the USC Viterbi School of Engineering, was designed to bring engineering expertise to bear on innovative technologies for ASD with potential clinical applications. Solomon also hopes to take autism research in as yet unexplored directions by focusing on how communicative bodies in cultural space use a range of semiotic resources (speech, literacy-based artifacts, objects, equipment, therapy animals, etc.) to engage in shared actions, activities and meaning-making that shape human life. That Solomon holds these interdisciplinary perspectives in such high regard comes as no surprise in light of her own interdisciplinary academic training. She holds a PhD in Applied Linguistics from the University of California, Los Angeles, a master’s degree in Clinical Psychology from Antioch University and a bachelor’s degree in Electrical Engineering from Northwestern Polytechnic Institute, in her native Russia. This unique mix of academic training, combined with her personal perspectives on cross-cultural experiences and communication, is an asset to conducting the essentially interdisciplinary nature of occupational science research. According to Solomon, occupational science is a social science, and as such, has made and will continue to make contributions to social science disciplines. “I find the occupational science and occupational therapy perspective conceptually rich and theoretically exciting, because of my interest in the intersections of embodiment, experience, action and activity,” she says. And though she had already held a faculty position within the Division for the past several years, the transition to the tenure track marks a turning point in every scientist’s career trajectory. Solomon, O. (2011). Rethinking baby talk. In B. Schieffelin, E. Ochs, & A. Duranti (Eds. ), Handbook of language socialization (pp. 121-140). New York, NY: Wiley-Blackwell. Test tubes and pipettes — the trademark tools for conducting bioscience research — are objects not typically handled by many occupational science or occupational therapy faculty members in the course of everyday research. But in the hands of behavioral neuroscientist Barbara Thompson, these tools aid in translating basic science into improved clinical interventions for people with autism. Today, nearly 70 years after the first report of autism in the 1940s, scientists are still working to delineate and clarify the underlying neurological mechanisms outwardly manifested as the condition’s classic behaviors — impaired social interaction, communication deficits and restricted or repetitive interests. A better understanding of the neuroscience of autism and autism spectrum disorders (ASD) may lead to breakthroughs in clinical treatment approaches, with potential benefits for children, adults and the families of those who live with the disorder. Barbara Thompson is optimistic that her neuroscience research will help elucidate the neurobiological disruptions in autism and help drive innovative clinical approaches to improving the lives of those with autism and ASD. Thompson comes to the Division from her previous position as research assistant professor in the Department of Cell and Neurobiology at the Keck School of Medicine of USC. There, she worked with renowned neurobiologist Pat Levitt at USC’s Zilkha Neurogenetic Institute. Prior to arriving at USC, Thompson received her PhD from the University of Delaware and was a postdoctoral fellow at Vanderbilt University Medical Center’s Department of Pharmacology. As Thompson discovered, interdisciplinary interests are valuable commodities in neuroscience research programs. As a postdoctoral fellow, Thompson studied the brain’s reward system and its associated pathologies in both mice and rabbits. This work linking conceptual neurobehavioral models in human populations to basic research using animal models provided a blueprint for Thompson to examine clinical therapeutic applications for humans through the use of animal models. Her research, published in Neuron, Autism Research and Behavioural Brain Research, demonstrates a synthesis of neuroscience and clinical psychology perspectives. Thompson hopes to discover new information about the ways in which brain anatomy, neurological pathways and preexisting vulnerabilities coalesce to contribute to the behaviors observed in people with autism spectrum disorders. While such heterogeneity is indeed a hallmark of ASD, it is also a confound contributing to the mysterious etiology, or causes, of the disorder. 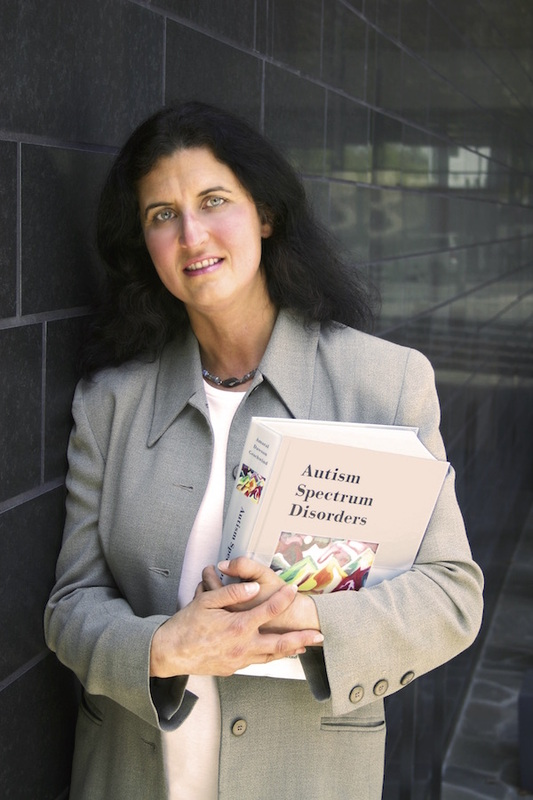 Her research holds potential implications for thousands of clinicians, including occupational therapy practitioners, who provide therapeutic interventions for children with ASD every day. “We hypothesize that each child will display unique behaviors and will therefore benefit most from individualized intervention. However, for individualized intervention to occur, we must first understand the behaviors within each child, and therefore the underlying neurobiological disruptions,” says Thompson. Developing fully individualized interventions will, in many ways, depend on the type of neuroscience knowledge that Thompson is working to discover. Eagleson, K. L., Campbell, D. B., Thompson, B. L., et al. (2011). The autism risk genes MET and PLAUR differentially impact cortical development. Autism Research, 4, 68-83.